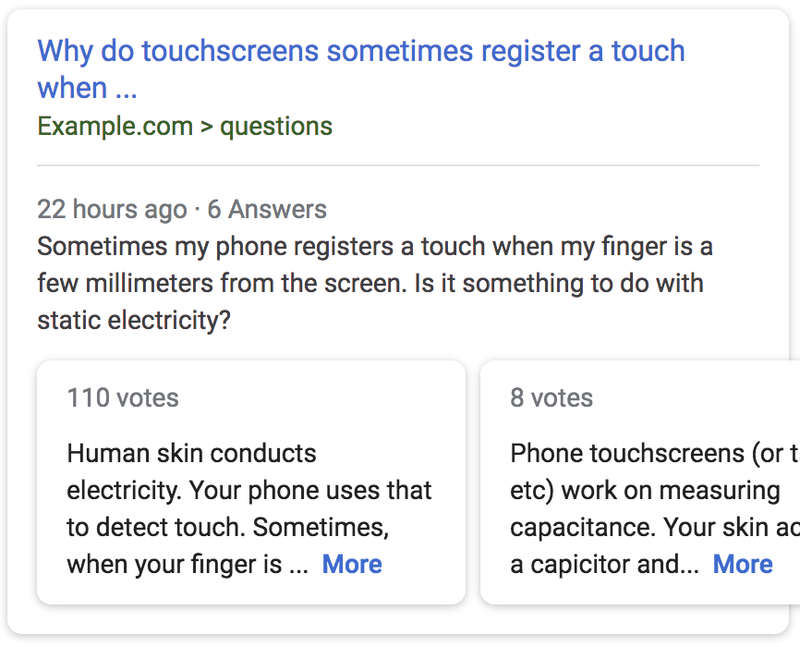 This entry was posted in Google Webmaster Central Blog and tagged AMP, mobile, search results on April 17, 2019 by Google Webmaster Central. 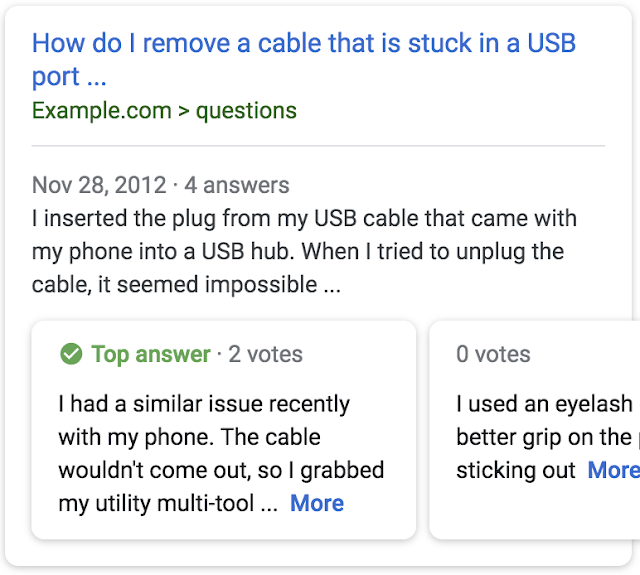 This entry was posted in Google Webmaster Central Blog and tagged search console, search results, webmaster tools on April 10, 2019 by Google Webmaster Central. This entry was posted in Google Webmaster Central Blog and tagged crawling and indexing, search console, search queries, search results on March 26, 2019 by Google Webmaster Central. Use structured for rich presentation: Both those using AMP and non-AMP pages can make use of structured data to optimize your content for rich results or carousel-like presentations. 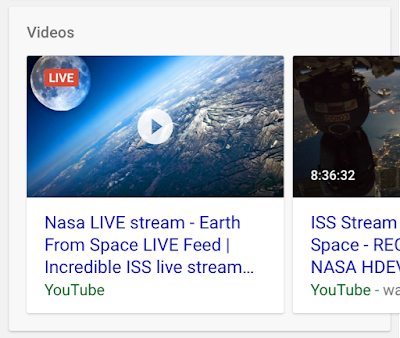 This entry was posted in Google Webmaster Central Blog and tagged Google News, search results, Structured Data on January 17, 2019 by Google Webmaster Central. 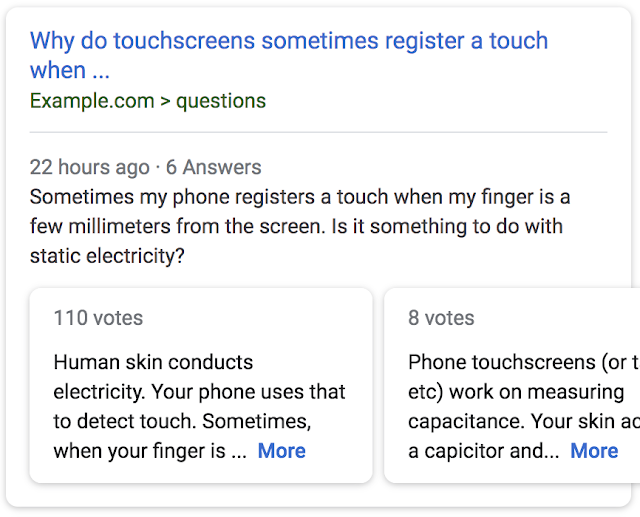 This entry was posted in Google Webmaster Central Blog and tagged rich cards, rich results, search results, Structured Data on December 3, 2018 by Google Webmaster Central. Last June we launched a job search experience that has since connected tens of millions of job seekers around the world with relevant job opportunities from third party providers across the web. Timely indexing of new job content is critical because many jobs are filled relatively quickly. Removal of expired postings is important because nothing's worse than finding a great job only to discover it's no longer accepting applications. Today we're releasing the Indexing API to address this problem. This API allows any site owner to directly notify Google when job posting pages are added or removed. This allows Google to schedule job postings for a fresh crawl, which can lead to higher quality user traffic and job applicant satisfaction. Currently, the Indexing API can only be used for job posting pages that include job posting structured data. For websites with many short-lived pages like job postings, the Indexing API keeps job postings fresh in Search results because it allows updates to be pushed individually. This API can be integrated into your job posting flow, allowing high quality job postings to be searchable quickly after publication. In addition, you can check the last time Google received each kind of notification for a given URL. Follow the Quickstart guide to see how the Indexing API works. If you have any questions, ask us in the Webmaster Help Forum. We look forward to hearing from you! This entry was posted in Google Webmaster Central Blog and tagged API, job search, search results, Structured Data on June 26, 2018 by Google Webmaster Central. Last year, we launched job search on Google to connect more people with jobs. When you provide Job Posting structured data, it helps drive more relevant traffic to your page by connecting job seekers with your content. To ensure that job seekers are getting the best possible experience, it's important to follow our Job Posting guidelines. We've recently made some changes to our Job Posting guidelines to help improve the job seeker experience. When job seekers put in effort to find a job and apply, it can be very discouraging to discover that the job that they wanted is no longer available. Sometimes, job seekers only discover that the job posting is expired after deciding to apply for the job. Removing expired jobs from your site may drive more traffic because job seekers are more confident when jobs that they visit on your site are still open for application. For more information on how to remove a job posting, see Remove a job posting. Job seekers find it confusing when they land on a list of jobs instead of the specific job's detail page. To fix this, put structured data on the most detailed leaf page possible. Don't add structured data to pages intended to present a list of jobs (for example, search result pages) and only add it to the most specific page describing a single job with its relevant details. If you add salary information to the structured data, then also add it to the job posting. Both salary figures should match. The location in the structured data should match the location in the job posting. Providing structured data content that is consistent with the content of the job posting pages not only helps job seekers find the exact job that they were looking for, but may also drive more relevant traffic to your job postings and therefore increase the chances of finding the right candidates for your jobs. If your site violates the Job Posting guidelines (including the guidelines in this blog post), we may take manual action against your site and it may not be eligible for display in the jobs experience on Google Search. You can submit a reconsideration request to let us know that you have fixed the problem(s) identified in the manual action notification. If your request is approved, the manual action will be removed from your site or page. For more information, visit our Job Posting developer documentation and our JobPosting FAQ. This entry was posted in Google Webmaster Central Blog and tagged job search, rich cards, rich results, search results, sitemaps, Structured Data, webmaster guidelines on April 27, 2018 by Google Webmaster Central. We encourage developers to think broadly how about performance affects a user’s experience of their page and to consider a variety of user experience metrics. Although there is no tool that directly indicates whether a page is affected by this new ranking factor, here are some resources that can be used to evaluate a page’s performance. This entry was posted in Google Webmaster Central Blog and tagged mobile, Performance, search results, speed on January 17, 2018 by Google Webmaster Central. As a reminder, the AJAX crawling scheme accepts pages with either a "#!" in the URL or a "fragment meta tag" on them, and then crawls them with an "?_escaped_fragment_=" in the URL. That escaped version needs to be a fully-rendered and/or equivalent version of the page, created by the website itself. With this change, Googlebot will render the #! URL directly, making it unnecessary for the website owner to provide a rendered version of the page. We'll continue to support these URLs in our search results. We expect that most AJAX-crawling websites won't see significant changes with this update. Webmasters can double-check their pages as detailed below, and we'll be sending notifications to any sites with potential issues. Verify ownership of the website in Google Search Console to gain access to the tools there, and to allow Google to notify you of any issues that might be found. Test with Search Console's Fetch & Render. Compare the results of the #! URL and the escaped URL to see any differences. Do this for any significantly different part of the website. Check our developer documentation for more information on supported APIs, and see our debugging guide when needed. Use Chrome's Inspect Element to check the page's title and description meta tag, any robots meta tag, and other meta data. Also check that any structured data is available on the rendered page. This entry was posted in Google Webmaster Central Blog and tagged crawling and indexing, rendering, search results on December 4, 2017 by Google Webmaster Central.